Sometimes, life takes a detour. Shortly after graduating from high school, Chris and his best friend Win set out on their bicycles, determined to travel across the country before college. Like all good road trips, this trek is bumpy, memorable, and metaphoric. Towards the end of their journey, Win unexpectedly takes off by himself. Feeling abandoned and upset, Chris finishes the trip alone. When Chris comes home without Win, he has to answer to his parents, Win's parents, and the police. Where did his best friend go? Why? What really happened between Point A and B? As close as he thought they were after ten years of friendship, Chris found himself surprised by some of the things his best friend did during their trip. He learns even more as he unravels the mystery of Win's disappearance. In the summertime sequences, their dialogue is always comfortable, sometimes teasing, sometimes competitive. They are friends who almost act like brothers, but they aren't one in the same. Chris comes from a working class family while Win, whose parents are well-off, obviously has difficulty getting along with his father. Growing up, the boys didn't really think about going their separate ways, but now that they have, Chris must figure out what his friend wanted and what he must do. 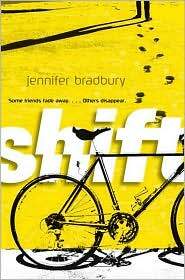 Readers will easily navigate through Jennifer Bradbury's novel Shift. Like a good film noir, the story unfolds using both the past and the present: the chapters alternate between the here-and-now, with Chris starting his freshman year of college, and the summer, as Chris and Win make their way across the country. Their friendship and the investigation are accompanied by bicycles, patches, jackets, one glove, small towns, campgrounds, diners, and postcards. Though the element of mystery is always there, Shift is not a whodunnit. Instead, it asks: Why did Win leave? Who is he, really? How well do we really know anyone? Reality had a disappointing habit of not measuring up to my memories. [E]veryone kept telling me how much fun I was going to have in college, how much freedom I'd have. I was starting to believe that I'd used up my lifetime quota of both on the trip this summer. Read my exclusive interview with author Jennifer Bradbury. Also check out ShelfElf's GLW post about the book.